These days, it’s hard not to overhear a conversation about a new app on the market or software product development. Some creations are superfluous—do people really need another photo-sharing app? But the burgeoning world of technical tools is solving real, important problems in society, from healthcare to environmental preservation to education. Educational technology, or edtech, is one such industry that is receiving increasing attention and investment, and entrepreneurial individuals are taking note of this. TechCrunch is even touting edtech as “2017’s big, untapped and safe investor opportunity” and forecasts its worth to be $252 billion by 2020. One challenge facing educational start-ups is that many technologists don’t have real world teaching experience or have been out of the school system for so long that they’re out of touch with the classroom experience. And teachers who may have dynamic ideas for software or apps in education don’t have the technical know-how, access to investment, or experience starting a company from scratch. Technologists need to seek out the engagement of the teaching community. Teachers must inform the product development and implementation processes in the classroom in order for edtech tools to achieve their promise. Teachers have the best insights and guidance to offer edtech companies as they understand the learning process and subtleties that may not be obvious to people who haven’t been in their position of running a classroom and designing curriculum. In special cases, teachers have taken the development of tech solutions for classrooms into their own hands. Several edtech startups have been founded by teachers who became inspired with an idea for how to improve the education industry. These new ventures might have started as a way for students to better study and prepare for tests, or were launched to offer a more concise grading and learning tracking system. Entrepreneur Jeff Scheur taught high school English for eight years. Many teachers struggle with a broken feedback loop with their students when grading essays, and rather than just sitting back and complaining about the problem, Jeff founded No Red Ink in 2012. “Like so many educators, I graded well over 15,000 papers, wondering how I could develop more efficient systems to help my students quickly address their misconceptions,” he writes on the company’s website. No Red Ink helps thousands of students develop their writing skills via fun and engaging exercises on the platform. Students can rearrange sentences, edit and mark-up text, organise ideas into outlines, and manipulate multi-paragraph passages. It’s not one-size-fits-all thinking, either—the platform is adapted to each student’s needs and pace to make a personalised experience. Teachers can use color-coded heat maps to see the progress of each and every student. It’s no wonder the platform suits Rachel and millions of other teachers’ needs: it was founded by Paul Edelman, a New York City public school teacher. Edelman developed Teachers Pay Teachers after realising that there was phenomenal, untapped potential in the work that teachers create for every lesson on a daily basis. Now, teachers all over the world (like Rachel) are using the platform, and the needs of students everywhere are being met. “It’s not until you’re in the classroom until you realise and really understand the pain points,” says Benjamin Levy. While teaching eighth graders in California, he realised the potential beneficial outcomes if educational videos could be more interactive. He created PlayPosit, which lets teachers add questions to online videos. The site is backed by AT&T and Stanford’s Startx, and now has over two million users. If you’re an educator looking for ways to become more involved in creating new tools for learning in the digital age, here are several recommendations to get the ball rolling. 1. Build your product development and entrepreneurial skills. Don’t be intimidated by lack of technical skills or knowledge; it’s never too late to develop such skills if you have the passion and motivation to learn them. General Assembly is one such resource that can be useful if you desire to become proficient in coding, UX design, and other skills needed to develop edtech tools. The company has campuses all over the world and offers short-term and longer-term courses in the various disciplines. Courses can be pricey, but the company also offers scholarships to underrepresented groups. Even having a basic understanding of these disciplines can allow you to more easily communicate and collaborate with developers and designers that you may work with to create such tools. 2. Look for advisory positions at edtech companies. While some teachers create apps and tools on the side, juggling both careers can be challenging. However, teachers don’t need to leave academia or their position as teachers to impact edtech development. Rather than creating and founding a company, teachers can become advisors to existing companies. It’s ideas like these that technologists could put to good use. If you’re a teacher, it might be worth reaching out to companies and offering to advise their product ideation or development process. The input is incredibly valuable, not only to the company but to the end users, whether they be teachers or students. An EdSurge article published in March this year profiled Sarah Rich, a former teacher who became a FUSE RI Fellow with the Highlander Institute after learning about and developing a passion for blended learning. Subsequently, a reading skills-focused edtech company called Squiggle Park reached out for help with development, and she became the Lead Teacher on their Leadership team. 3. Collaborate with or hire developers to build tools to fit educational needs. As they are often siloed from the technical product development world, educators and academic administrators often hesitate to explore technological solutions to problems they face, and it can seem intimidating to reach out and co-create solutions. Christopher Shanti Burkey is an open source developer who created EnterMedia, a media database utilised by universities for storage of video and other digital content used for curriculum and teaching. He was first approached by a department head at South Dakota University to create a media storage database. Christopher puts it in simple terms: “I think there’s a real fight between the techies and non-techies.” As stated earlier, educators don’t usually have the technical know-how to create systems and tools that will be useful in their industry, and developers don’t have the deep insights and experience needed to create products best adapted to the needs of users in education, whether they be teachers or students. The point? Increased conversation and collaboration between both worlds will significantly benefit the future of learning. 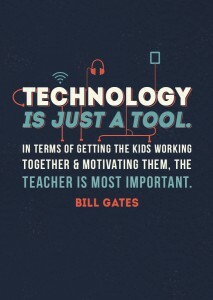 Technology in schools represent the mentality of the school. It is necessary because everything is going with the help of technology, it is due to the technology that now days learning process becomes easier for parents and teachers as well as students. So In my opinion all school must adopt the technology in school to manage the school in easy manner thus save time, even better for schools to hire social media professional who can manage the school social media profiles. A better school a better education a better mentality. Great Article.. i have also noticed this education system and here is my suggestion for teachers to integrate the technology in current educational system. Online posting of grades and assignments. Group projects completed through collaborative software. Assignments completed online and uploaded through classroom portals. Students using cloud storage instead of flash drives or paper to store their work. Teachers, parents, students, and administrators communicating via social media platforms designed specifically for education. Great Article. I have also noticed this education system and here is my suggestion for teachers to integrate the technology in the current educational system. Your article seems really informative. As people are doing progress in every area of life. They should always take education with the same priority. Like using of technology will make the task easier for everyone including the students. The new things will gonna makes things much exciting. I work in the Center for Innovative Education “Pro.Svit” (Ukraine) and would like to utilize the translation of your excellent article on our website with your kind permission. Could you approve it? Thanks! Yes. It’s totally true. It’s all up to teachers. They can change the way of teaching by the latest technology. So a student can get the advantages of new technology. However, Some manual education system must be excluded. So the student can focus on practical knowledge rather than books knowledge. Especially thanks to you for this article. As the technology is advancing, teaching way and method should also move parallel as each and every student must be aware of the technological advancement taking place and benefits of the same. And your article is provides puts more light on it. Thanks for sharing and appreciate your concern about the change in teaching. You pointed out the good reason that can help to change the teaching by using technology. Now, Technology is playing important role in our lives so why not use it in teaching. All teacher community should learn how to give more values to the societies and build an ecosystem to help students. You point out a genuine reason to divert technology because in these days technology and learning method is rapidly changing. When i was in school i was not so good at english but youtube help me alot . I shared this post to all my colleague. Frequently speaking then, without technology there is nothing in the world. so technology is very important and you . now a days it is very essential tool in everybody’s life. Technology make education easy for students, now students can learn according to their speed. Education creates technology to make it easy. However, Some manual education system must be excluded. So the student can focus on practical knowledge rather than books knowledge. Especially thanks to you for this article.